Los Angeles County Sheriff's Department Missing Persons Unit is advising that At Risk Missing Person Alexcander "Luckie" Fuller was located safe. Thank you to everyone for their efforts in trying to locate Mr. Fuller, your efforts are appreciated. 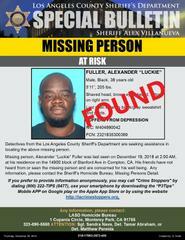 Los Angeles County Sheriff’s Department’s detectives are asking for the public’s help in locating At-Risk Missing Alexander “Luckie” Fuller. 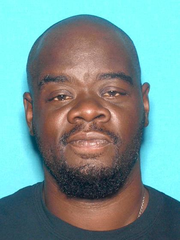 He is a 38-year-old who was last at his residence on the 14900 block of Stanford Avenue, Compton, on Wednesday, December 19, 2018, at approximately, 2:00 AM. Mr. Fuller is described as 5’11”, 205 lbs, shaved head, brown eyes, has a beard and a tattoo on his right arm. He was last seen wearing a black and gray sweatshirt and black sweatpants with a red line along the side. Mr. Fuller suffers from Depression. His family has not seen or heard from him. They are very concerned and asking for the public’s help in locating him.